MODBUS is a communication protocol widely used for monitoring and controlling various industrial automation equipment represented by PLC (Programmable Logic Controller). It was developed based on serial, but it also has been expanded to network version for application in various communication environments. 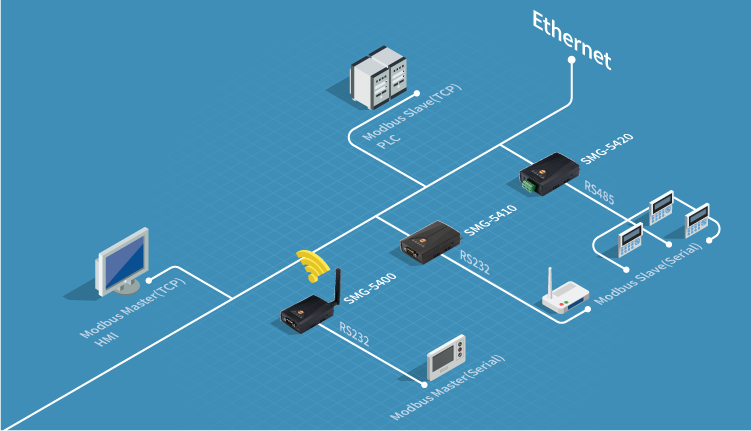 The serial (Modbus/RTU and Modbus/ASCII) and network versions (Modbus/TCP) are similar, but still different protocols. The Modbus Gateway provides protocol conversion between Modbus/RTU (or ASCII) and Modbus/TCP, allowing MODBUS devices with different interfaces to communicate with HMI (Human Machine Interface).